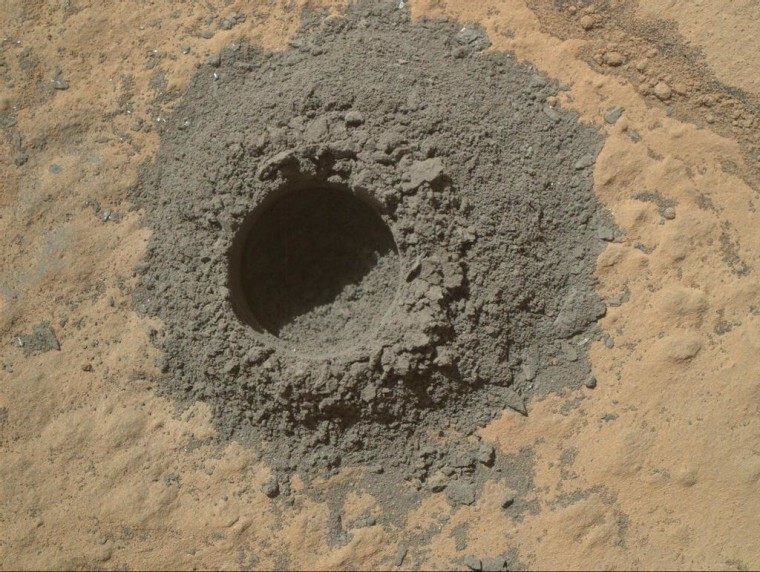 NASA's Curiosity rover has collected samples from deep inside a rock on Mars for the third time ever. The 1-ton Curiosity rover bored into a slab of Red Planet sandstone dubbed Windjana on Monday evening, creating a hole measuring 0.63 inches (1.6 centimeters) wide and 2.6 inches (6.5 centimeters) deep, NASA said. In the coming days, Curiosity will use its scientific instruments to analyze the powder collected during this drilling operation. The team chose to drill into Windjana partly to investigate the material that binds sand-size grains together in the rock, NASA officials said. The newly drilled hole is close to a shallow test hole Curiosity dug last week to get a preview of Windjana's interior. In its two previous drilling activities, Curiosity bored into fine-grained mudstones at a site called Yellowknife Bay, which is close to the spot where the rover touched down in August 2012. Analysis of the resulting samples revealed that, billions of years ago, Yellowknife Bay harbored an environment capable of supporting microbial life. The Windjana rock is about 2.5 miles (4 kilometers) southwest of Yellowknife Bay, on the way toward the foothills of 3-mile-high (5-kilometer-high) Mount Sharp. Mount Sharp is Curiosity's ultimate science destination. Quiz: How Well Do You Know NASA's Curiosity Rover?